It’s the mid 1950s in Russia. As the country sunk deeper into its Cold War with the West, Soviet military minds began to realise that if push ever came to shove, they would probably need a replacement for their current army motorcycle, the Ural (or more correctly, the Irbit) M-72. 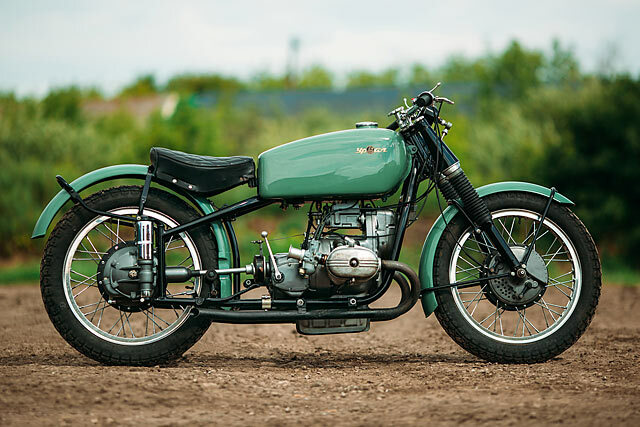 Based on a brash reproduction of the BMW R71, its 20-year-old days were numbered. The replacement? Well, if pinching ideas from Deutschland worked once… So they acquired themselves an R51/3 and got to work removing the pork knuckle and adding a little beef stroganoff of their own. And then they took it racing. The result? Meet the Ural M-52S from Motorworld by V. Sheyanov.